Regular version of WAPT includes all the basic features required to test a web site with up to 2,000 concurrent virtual users. Professional version can use several systems for load generation, remotely control test execution, monitor server performance and handle complex parameterization. Cloud version of the most powerful load testing solution based on WAPT Pro and all extension modules. Powerful load generation utility that can be used together with WAPT Pro to create 10,000 and more virtual users per system. Enables the automatic parameterization of the view state and event validation values. Enables the automatic parameterization of session-specific values found inside JSON structures and creates formatted JSON representation. Converts binary AMF structures used by Flash applications to XML form. Utilizes WebSocket protocol for instant data updates. Automates client-set cookies creation in PeopleSoft tests. Converts binary MSBIN structures used by Silverlight applications to XML form. Converts GWT data to XML structures facilitating work with session-specific values. Provides the ability to work with the binary data inside the HTTP requests and responses. Parameterizes the form digest values in the headers and request parameters of SharePoint applications. Tell us more about your project and we will provide recommendations on software licenses and hardware configuration required to perform your load test. Need help creating a custom test for a website? We are ready to work with you on the test specification and deliver ready to use source files. Accurate emulation is guaranteed. Hire us for a full load testing project. Specify the goals and let us design and run the test. Get the complete analysis and recommendations in the report prepared by our QA team. We provide customer support for existing and new customers free of charge. You are welcome to contact us with any questions from pure technical to sales and business opportunities. From choosing components to product functionality and licensing. The complete reference on the WAPT Pro user interface and functionality. A short step by step instruction on how to create a simple but very typical test scenario for a web site, launch the test and interpret its results. Version history and our upgrade policy for existing customers. The fastest way to get familiar with load testing and WAPT key features. 7 reasons why you will be better off with WAPT Pro unless zero license cost is your only target. How the choice between LoadRunner and WAPT Pro is seen from the new user perspective. Load testing tools and services offered by SoftLogica Inc. A guide for decision-makers. With more than 3'000 customers worldwide, WAPT is the well-known brand on the performance testing market. Read what our clients have to say about our tools and services. The place where users of our tools discuss their testing challenges and technical solutions. In-house expertise, best testing practices, product announcements, etc. Patient education - a learning website where people can train their skills. iOS application - an online ticketing system integrated with additional services. Load balancer - an insurance service with up to 10,000 concurrent user sessions. CRM system - a universal bank with broad range of products and services. 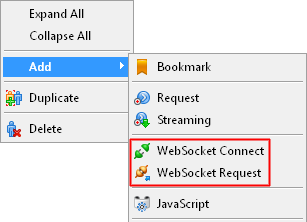 Select Add - > WebSocket Connect to add a new Connect item, or Add - > WebSocket Request to add a new Request item. 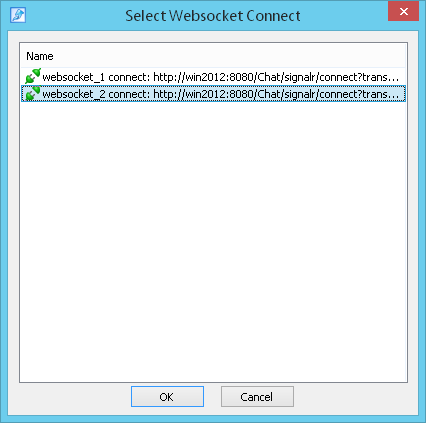 Select the necessary WebSocket connection and click "OK". There are other ways to add new WebSocket items: using the "Add" button on the program toolbar or "Add" option on the "Edit" menu. SharePoint® is a registered trademark of Microsoft Corporation.